Normally I don't post much NSR stuff here on my blog - but I just couldn't resist sharing this picture with you. This is our almost 4 year old yellow lab - Lou. He loves to be in the pool with the kids. 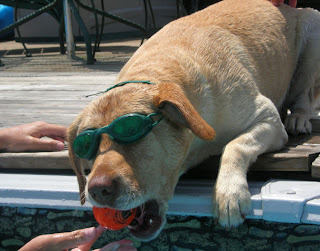 Today was no exception and the boys thought he should put on his goggles to swim. I would have scrapped a page with it, but currently my photo printer is out of ink. It's been really hot/humid here in IL over the last few days - today it's supposed be 95+ with the heat index near 105. Hope you all stay cool! OMG GF this is the cuttest photo I have ever seen .. what a keeper.. this photo is sooo AWESOME .. OH I wish our doggie would wear goggles .. I just love it .. I swear they are part Human huh? Great shot, thanks for sharing. Lou is Very Cool!!!! I am sure all the other doggies in the neighbourhood would want to hang with Lou !!!! Dear Lou: You are my kind of dog! That is a very good look for you. Drop by & see me sometime when you're out in CA.